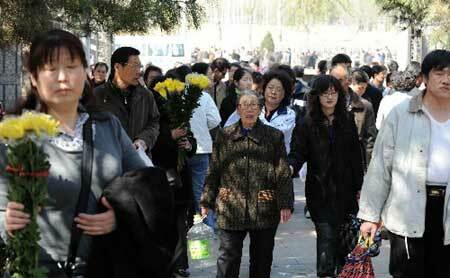 BEIJING -- Some 600,000 people visited graveyards in the suburbs of Chinese capital Beijing on Friday, about triple last year's figure of 189,000, according to official statistics. On December 16, the State Council (cabinet) revised the nation's official holiday schedule to add three traditional festivals -- Qingming, Duanwu and Zhongqiu -- in response to public calls. It also changed the length of other holidays. The holiday marked on Friday was Qingming, or grave-sweeping day. The change was intended to allow more people to pay their respects to deceased relatives on what would otherwise be a workday like Friday. No national figures on this year's tomb visits were immediately available. Unlike Beijing, many residents of Shanghai, China's largest metropolis and one of the most densely-populated cities, have to go to neighboring cities to visit relatives' tombs. Space for the dead is at even more of a premium in Shanghai than for the living, and the city's graveyards long ago stopped accepting new remains. Suzhou, Jiangsu Province, receives 900,000 tomb-sweepers from Shanghai every year. Friday was a day of remembrance in many areas of China. In Huangling County, Shaanxi Province, 8,000 people including some senior officials attended the annual memorial service at the tomb of Huangdi, the "Yellow Emperor" of Chinese legend. Governor Yuan Chunqing addressed the gathering and expressed his hopes that the Beijing Olympic Games would be successful, the reunification of China would occur and the world would become harmonious. Scholars say that Qingming has preserved the "feeling" of being Chinese across the generations. "Traditional culture has been infused with new spirits in different eras, and this is the mysterious power of Chinese Culture," Shi Aidong of the Chinese Academy of Social Sciences, told Xinhua in an interview. Qingming is always a day of bitter memories for residents of Nanjing, the provincial capital of Jiangsu. The Memorial Hall of the Nanjing Massacre received numerous domestic visitors -- and many from Japan. "We, from the aggressor side of the war, want to show regret to the victims on this special day," said one of the Japanese visitors. In December 1937, invading Japanese troops slaughtered 300,000 Chinese soldiers and civilians in the city, which was then the national capital. Many of the bodies were never properly interred, and many of the Chinese visiting the memorial on Friday have no graves to visit. Fuzhou, the capital of Fujian Province in east China, unveiled a monument ln honor of the thousands of firefighters died on duty since 1949. It is the first such monument in the country.